Fall Rush 2019 is right around the corner and we are looking for referrals or recommendations for incoming GT freshmen who are a good fit for Gamma Alpha. The chapter is thriving – but we need your help to keep up the momentum. Please send referral names to me, Parker Quarles (contact info below), so that we can include them in our various spring and summer social activities. A big thank you to our Alumni for all you do! The current plans are to scrape the house in August 2006 and turn over the new house to the undergraduate brothers in July 2007. Where will the undergraduate brothers live during the construction? The current undergraduates are staying together in groups both on and off campus. Fifteen will be in campus housing, 20 are in four houses and an apartment in Berkeley Hills, and others are securing off-campus housing in groups of three or four. Why are we building a new house? The current house, which was built around 1950, is not aging gracefully. 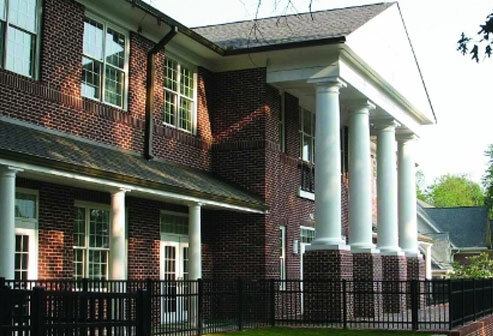 Over half the fraternities on campus have built new houses or undertaken major renovations in recent years. Many more chapters are launching fundraising campaigns to start building projects. For us to continue to attract quality pledges and remain competitive with other fraternities, we must build a new facility. We owe all future generations of Sigma Nu brothers a house befitting the standing of our chapter on the Georgia Tech campus. How big will the new house be? With the approval and endorsement of the Georgia Tech Facilities Office, the Georgia Tech master planning and design team, and university president Dr. Wayne Clough, our new house will have approximately 13,000 square feet of living space, including a chapter room, dining room, commercial and residential kitchen, and sleeping quarters accommodating 45 brothers. The sleeping quarters will include four suites with private baths downstairs for officers and brothers with the lowest chapter numbers. We will also have state-of-the-art facilities with study rooms, conference rooms and office space for chapter leaders. Additionally, the house will have a wrap-around porch for rocking chairs, new decking around the pool, and a barbecue pit and new basketball pavilion with gardens in the rear patio area. What is the fundraising goal of this campaign? We aim to raise $4 million or more from monetary pledges. Sigma Nu will borrow for the project and construction costs until the pledge payments are fulfilled. Will the national fraternity give us any money for the project? No. While our national fraternity is very supportive of our efforts, we will fund the project through the generous donations of Sigma Nu alumni and friends. What do the undergraduate brothers think about the project? They are very excited about their new house and have been remarkably generous in their financial support. To date, 100 percent of the undergraduate brothers have pledged $200 each per year over five years, for a total of $1,000 from each brother, which will result in over $50,000. The undergraduate brothers are also working closely with the alumni brothers and the board to ensure the success of the project. Affinity Connection is a professional fundraising firm specializing in managing fraternity and sorority capital campaigns. The company has worked closely with Sigma Nu for years, publishing The Rose & Star newsletter, maintaining our alumni records database and assisting the chapter with alumni relations. Affinity Connection has been an influential partner with Sigma Nu and has played a key role in the success of the campaign to date. I am interested in financially supporting the campaign. How does the process work? You will make a five-year, interest-free pledge. You have the choice of being invoiced quarterly, semiannually or annually to pay it off. You also have the choice of making a one-time contribution to satisfy your pledge. Your first pledge payment will help reduce the amount of the required bank loan for the project. Current gifts range anywhere from $200 per year for five years from the undergraduates to $50,000 a year for five years from two Gamma Alpha alumni. Will my contribution be tax deductible? The IRS has ruled that donations to fraternity house corporations are generally not tax deductible. Although Gamma Alpha is a not-for-profit entity, we are not a chapter 501(c)(3) charitable organization. In the eyes of the IRS, this campaign is not resulting in a purely educational building for a charitable organization. What will my contribution be used for? All pledge payments for the campaign will go to costs associated with building the new house. The Sigma Nu Housing Corporation will use all campaign donations for the architectural fees and construction costs related to the project. Gamma Alpha of Sigma Nu has a proud past as one of the oldest and strongest chapters on the Georgia Tech campus. Things haven't always been easy for us, but our chapter has always been infused with passion, devotion and the determination to succeed. Sigma Nu was founded in 1869 at the Virginia Military Institute (VMI). Three cadets - James Frank Hopkins, Greenfield Quarles and James McIlvaine Riley - met secretly at "The Rock" located on the VMI parade grounds. The three were adamantly opposed to the extreme hazing at VMI and decided to form the Legion of Honor in October 1868. This non-hazing coalition remained secret until January 1,1869, when Sigma Nu became the official name of the Legion of Honor. From its founding, Sigma Nu's popularity and initiation of new chapters primarily took place in the South. On November 25, 1896, the Gamma Alpha Chapter of Sigma Nu at Georgia Tech was chartered as the 48th chapter of the Sigma Nu Fraternity. The driving force behind our chapter receiving its charter was William L. Kemp, a member of the Mu Chapter at the University of Georgia. At the time we received our charter, Sigma Nu was the third fraternity on the Georgia Tech campus. Our first chapter house was located off of I-75 and 5th Street. The experiences of the brothers of Gamma Alpha during the 1940s were completely different from those before and after. During the years around World War II, there were no summer breaks, so classes typically were held throughout the calendar year. This acceleration of classes allowed students to graduate in just three years. The era also saw several of our brothers volunteer for military service and leave Georgia Tech prior to graduation at very young ages. For those who stayed, after receiving their degrees the brothers who did not serve directly in the war were encouraged to utilize their educational skills to speed war goods to the front or to develop new products to assist in the war effort. The bonds that developed during this stressful and challenging time were forged through love, concern and patriotism. It was common for brothers returning from the war and to Georgia Tech to pledge Sigma Nu. Imagine a pledge class comprised of 18-year-old freshmen right out of high school and 28-year-old grizzled WWII vets. The merger of these vastly different experience bases provided a level of camaraderie unlike that in no other decade, and certainly represented a winning combination for Gamma Alpha of Sigma Nu. This decade proved to be among the most important for the growth of the brotherhood and the current chapter house. Sigma Nu began the 1950s having initiated approximately 900 brothers since our founding and with talk of constructing a new house. Between 1950 and 1951 our chapter rented a house on 10th Street. In 1951 we moved into our current house on Fraternity Row, at 750 Fowler Street. By 1956 Sigma Nu's rapid growth on campus made the addition of the house's second story necessary. In the summer of 1959, one of the fraternity's points of pride was the construction of our swimming pool. The entire construction was accomplished solely by the labor of our chapter's ambitious engineering majors. They used picks and shovels, and some blasting to clear the area of rocks. When completed, the swimming pool had a full circulating system and underwater lights. The pool has brought prestige and set our chapter apart from others at Georgia Tech, especially because it was the first built in the state of Georgia by a group of fraternity men. Other highlights of the decade include the house's pet pig, Salomey (there is no truth to the rumor that Salomey was the first guest of honor for the annual Pig Roast) and the organization of our chapter's Parents Club. During the 1950s our chapter's major philanthropic project was our yearly Christmas party for which we invited the orphans of Atlanta to our house and had our own Santa Clause give them presents. Finishing off the 1950s, we placed second both in overall intramural athletics and for the IFC trophy. We began the 1960s as the second-largest fraternity on the Georgia Tech campus, only four members shy of being the largest. With our continuing growth in brotherhood, we raised funds to redecorate the house for the first time since it had been built. The entire decade proved to be very successful for Gamma Alpha in all aspects of Greek life. In the early 1960s, the chapter realized the importance of academic excellence and began to focus - as a brotherhood - on excelling in the classroom. As a result, the chapter's ranking jumped from 22 to being included in the top 10 in overall GPA. However, the Snakes always ruled when it came to athletics. Throughout the decade, our opponents feared facing the ever-powerful and always passionate brothers of Sigma Nu. We won the IFC Intramural Trophy - awarded to the fraternity that accumulated the most points for athletics, academics and community service - five times. Most fraternities at Georgia Tech have not won it even once in their entire existence. In 1961, our defensive line in football was taller and bigger than that of the varsity football team. Our opponents scored only six points in the entire season. We even won a doubleheader versus Delta Tau Delta and then ATO to take the championship. Dean James Dull once accused us of illegal recruitment. In 1963, 1966, 1967 and 1969 we were the school champions with titles in football, volleyball, softball, track and paddle ball, and placed second in basketball and tennis. We routinely won the chariot races during Greek Week and the Campus Chest Drive, and we won at the Ramblin' Wreck parade in 1964 and 1968. Campus leadership was the norm, as many brothers held senior positions as student body and IFC presidents, and more. In the 1962-63 school year, we had the two highest elected and most powerful positions on campus: president of the student body and president of the IFC. And even back when it was not socially acceptable to have male cheerleaders, Sigma Nu blazed the path. Our social life at Sigma Nu also received gold medals throughout the 1960s, as we worked hard and partied harder. Saturday night gatherings at the Sigma Nu house were the top and toast of campus life. Bands like the Tams, Doug Clark and the Hot Nuts, and the Showmen were always at 750 Fowler. And, unlike other fraternities, we encouraged other chapters at Georgia Tech to join in. Maybe not all, but some! In 1967, as a scheme to get national TV exposure, a banner reading "Georgia Tech Sigma Nu Welcomes ABC" was positioned across Grant Field about 300 feet above the stadium. The next year, the flashcard section in the east stands was infiltrated to proudly once again proclaim Sigma Nu as number one. Many other things and events defined the colorful decade of the 1960s, including Ray Lab, JFK's assassination, bridge with Mom Glenn, V runs, Vietnam, Moe's & Joe's, painting the SAE lion, Manuel's, Willie "Get Out of My Kitchen" and "Hot One Time" Jones, several tragic and premature deaths of close friends and brothers, painting the SAE lion, fishing over-served Phi Delts out of the pool, spontaneous prayer with Dr. Clarence C.E. White, painting the SAE lion, playing Spades, KV ball and pool parties, the tube lab, Foosball, fine dining at Mary Mac's and the Huddle House, painting the SAE lion, Smokey Robinson and the Miracles, the Four Tops, the Beatles, Chicago Transit Authority, Al's Corral, PBR, and, yes, painting the SAE lion. All of us who were there, who experienced this magnificent decade, are truly better men for having been there. And we all continue to Walk in the Way of Honor! Gamma Alpha continued its dominance in the upper echelon of the fraternities on campus during the 1970s. Not unlike the other eras for Sigma Nu brothers enrolled at Georgia Tech, it was a time to study hard ... and then to unwind in an appropriate fashion. The rigors and demands of the academic standards at Georgia Tech during the week built up plenty of stress and energy to be released on weekends. We survived a variety of musical styles, and who will ever forget "Saturday Night Fever," disco and bell-bottomed pants with buckle shoes? Music ranged from Donna Summer to the Eagles, Pink Floyd and Meatloaf. "Star Wars" and "Jaws" were the top movies, and the tube lab was usually tuned to either "All in the Family" or "Happy Days." We endured several mediocre football seasons, and went from an NIT championship game at Madison Square Garden with Rich Yunkus as the leading scorer and All-American, to lightly attended games where students wore bags over their heads in shame and ignominy. The war in Vietnam wound down, gas lines were long and not uncommon, Alka Seltzer commercials on TV spawned the catch phrase "I can't believe I ate the whole thing," and Sigma Nu was as surprised as everyone else that governor Jimmy Carter was thinking about running for president. And, as fraternity memberships across the country declined due to rising anti-establishment sentiment, Gamma Alpha of Sigma Nu remained strong and continued its rich tradition of being a leader of men on the Georgia Tech campus. The brothers of Gamma Alpha of Sigma Nu didn't have a war to rally behind or to demonstrate against, or a national championship football team to cheer. The brothers did exactly what they were supposed to do: work hard and get a good education, experience the camaraderie and fellowship of the fraternity, and party like "Animal House" at 750 Fowler. Now don't think the "Animal House" film was close to resembling the Sigma Nus at Georgia Tech ... not exactly. But we had a great time and with no "double-secret probation," at least none that we knew of. Again, tastes in music varied widely, but a stroll down the back hall would typically be accompanied by the sweet cacophony of U2, Aerosmith or Dire Straits. "E.T." and "The Return of the Jedi" were the top-grossing movies, and the most-watched TV shows were "Family Ties," "Dallas," "The Dukes of Hazzard," and "Cheers." The outstanding parties and great times we had together were key to us making it through the challenging academic curriculum at Tech. Sigma Nus took pride in the fraternity's leadership in intramural sports across campus, our pursuit of excellence in the classroom and our outstanding wins in several Greek Week competitions. As we have witnessed firsthand - including the rigors of calculus and thermodynamics, the countless all-nighters, the horrendous exam schedule during finals week, searching for the Word in the dumpsters and, yes, making it through pledgeship and to initiation - the life lessons learned during these colorful times prepared us for leadership roles and strong careers. These lessons were not found in the books: They were found at the Sigma Nu Fraternity. The 1990s were launched with unprecedented enthusiasm and excitement at Sigma Nu as well as throughout the Georgia Tech campus. While our numbers dropped a bit in the mid-1990s, we had a great group of men providing diversity, strong brotherhood and enthusiasm for continuing our proud history on Fowler Street. Coach Bobby Cremins and the men's Yellow Jackets basketball team won the ACC Tournament and advanced to the Final Four for the first time. Dozens of Gamma Alphas made the long trip to Denver to root for the "Lethal Weapon 3": Kenny Anderson, Dennis Scott and Brian Oliver. Even though the Yellow Jackets lost to UNLV, the eventual national champion, it was a magical season for Georgia Tech and its fans. Not to be outdone, coach Bobby Ross led the Ramblin' Wreck football team to an 11-0-1 record and completed the 1990 season as the only unbeaten team in Division-1 college football. Tech captured the ACC championship and then thrashed an over-matched Nebraska in the Citrus Bowl in Orlando to win its fourth national championship; several brothers made the trip to cheer Georgia Tech to victory. In spring 1992, the IFC presented us with the award for the most improved chapter on campus. We continued our long standing involvement in campus leadership as well as our commitment to various civic causes including the Atlanta Steeplechase. Other than academics, our central focus was on maintaining the strength of the brotherhood and continuing the tradition of honor given to us by the brothers who had gone before. Throughout the decade, this aspect remained constant and was something we were proud to pass on to those who came after us. Personal computers, the Internet, e-mail, the first Gulf War, the Branch Davidians of Waco, Bart Simpson, the Braves winning the World Series, the Olympics in Atlanta, the Clinton affair, the first terrorist bombing of the World Trade Center and a host of other cultural and historical milestones each had an impact on the undergraduates' lives. Tastes in music ranged from Nirvana to the Backstreet Boys (ouch!). Top movies were "Titanic" and "Jurassic Park." When "Cheers" wound down on TV, thank goodness we had a replacement in "Friends." And who will ever forget Tonya Harding versus Nancy Kerrigan? The money was on Tonya. The Olympics generated a huge housing need for the athletes, and we updated the house in 1996 to accommodate a portion of this demand. We were out of the house for a year, which proved to be extremely challenging but also rewarding. The brothers had to work overtime on their commitment to each other and to preserving the legacy of the Gamma Alpha Chapter. While our brotherhood was stretched and pulled in many directions, we emerged with strength and unity. With a renovated house and a fired-up brotherhood, we pledged a very strong class of young men in 1996, who in turn led us through the end of the 1990s and into the new millennium.